Young Eastman Strings (YES!) is a comprehensive, educational program for all students, who are in 6th grade or younger, studying a bowed string instrument. The YES! program offers a learning path for any level of proficiency, which includes an exploratory class, private lessons, ensembles and progressive classes in fundamental, musical skills. At the completion of sixth grade, students may receive a certificate, recognizing their level of commitment to learning. Click here for our YES! brochure (PDF). The YES! program offers Bridges: String Starters, an exploratory course in ten-week sessions for kindergarteners with an accompanying adult. The class introduces children to the violin and viola, “shoulder instruments”, and the cello, which is played seated. Students learn basic motions, using simple, box instruments they build themselves. Games and songs introduce the pitches of open strings and rhythmic motions of string playing. Weekly homework helps students and families start to incorporate regular practicing into daily life at home. Parents may discuss of their child’s progress and interest for continued study with the instructor. The sessions culminate in the final week with an open “informance”, showing what the class has learned. When a student is ready for lessons, parents may register at any time in the school year. The ECMS Associate Dean will assign a teacher, if parents do not have a preference. The teacher will contact parents to discuss the new student’s interest and goals, answer questions and set a time/day for regular lessons. They may also recommend where and how to obtain an instrument for either rental or purchase. They may also recommend registration for ensembles or additional classes. At the start of lessons, the teacher will give parents a document, describing the policies and structure of their individual studio. 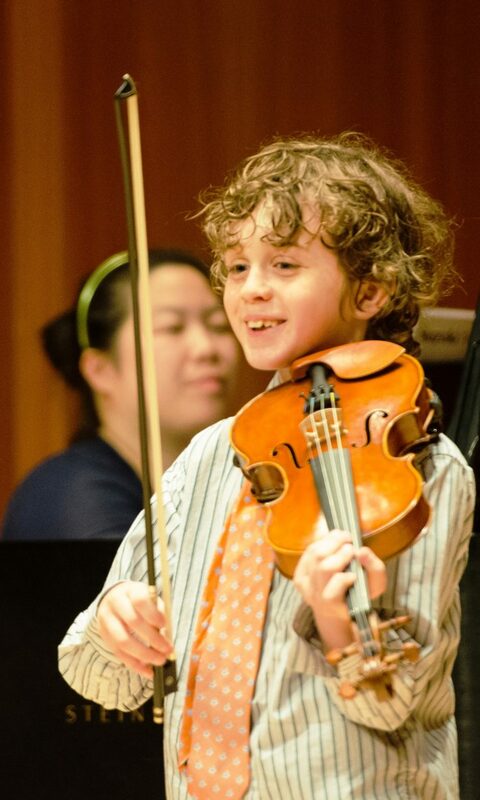 Private lessons are the centerpiece of our program, offered for study of the violin, viola, cello and bass. Our faculty include Instructors, who are experienced, professional performers and educators. ECMS also offers a budget-conscious option of study with interns, who are talented, collegiate students from the Eastman School of Music. The duration of lessons can vary, based on faculty recommendation. Students usually start with 30 min lessons, which are extended as they progress to 45 and 60 minutes. At home, students are expected to practice their instrument daily. For younger children, it is recommended that an adult attend lessons and supervise practicing. Lessons build a solid foundation of skills, and help move students toward a goal of performing at least twice annually. Progress is documented ad celebrated each spring, when students perform selected studies and pieces in short evaluations, called exams. The YES! program offers group learning at various levels of mastery in a fun and supportive environment. Placement is determined by faculty recommendation. Students, who have never played in an ECMS ensemble may be asked to play a short placement evaluation for faculty in late spring or early fall. 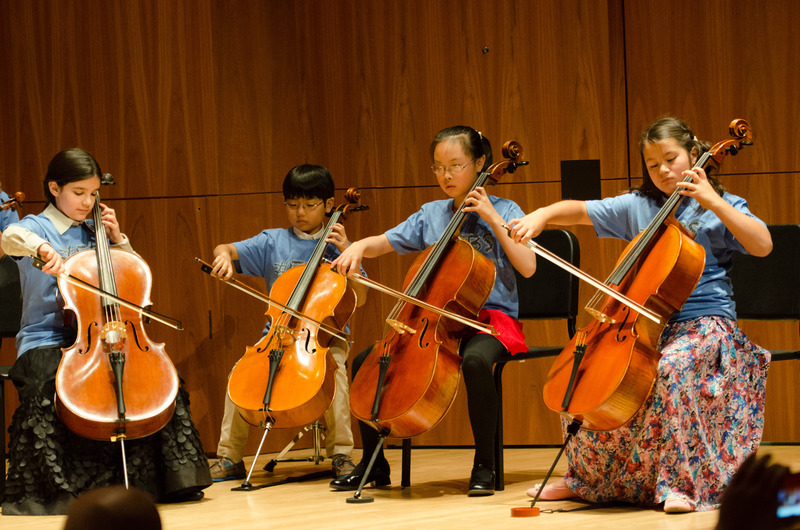 In the first stage of learning, while learning the motions and posture of stringed instrument performance, students are encouraged to supplement weekly private lessons with group violin or group cello classes. In a social, small group of 4-6 players, children can learn by observation and improve confidence to play their instrument. Group classes perform in biannual YES! recitals. For intermediate level students, who are can read music independently and play with a steady beat, the YES! program offers mixed ensembles of two levels. Tutti is for advanced beginner to intermediate players, and Camerata is for intermediate to more advanced students. Mixed ensemble skills include following a conductor and listening carefully to the unity and pitch of the group. The Tutti ensemble performs in YES! recitals. Both Tutti and Camerata perform in large ensemble concerts. Intermediate and advanced students may also be eligible to perform in a small chamber music group of 3-5 players. These groups are coached by faculty, but they perform independently, without a director. Playing chamber music requires students to both lead and accompany, according to the demands of the music. Students also learn ways to work as a team and collaborate effectively and respectfully with their peers. The YES! educational path includes recommended classes, which help students learn or improve fundamental skills, including singing pitches, reading music, and expressing rhythmic motions. Depending on age and proficiency, students may choose from a variety of options, including Early Childhood, Introductory Piano, Theory in Motion, Young Children’s Chorus and Children’s Chorus. Students may perform in dedicated YES! recitals during the school’s Winter (Dec.) and Spring (May) festivals. These are fun and relaxed events that enable students to connect with and support one another, celebrating their hard work and achievement through music-making and a post-concert party! Students may also perform in their teacher’s studio recital and/or masterclasses, which are performance workshops. ECMS also offers regular recital opportunities, available nearly every week throughout the year in Kilbourn, Hatch and Howard Hanson Halls. Accompanying services for these recitals are included in the tuition, and are provided through the ECMS office. Each year, sixth graders “graduate” from the YES! program, and we celebrate their achievement at the spring YES! recital. Students who have taken 2 years of private lessons may receive a Bronze Certificate of Achievement. Students who have taken 2 years of private lessons and 2 years of an ensemble (including group classes, Tutti, Camerata, and/or chamber music) will receive a Silver Certificate of Achievement. Those who study privately for 3 years and have completed 2 years of both ensembles and classes will receive a Gold Certificate of Achievement. All sixth graders are eligible for a certificate of participation. We are happy to acknowledge the dedication of both students and their families to a musical education through the YES! program at ECMS! For YES! Graduates: Keep Learning and Performing! Sixth-grade graduation from the YES! program is both an achievement and an open door to the next step in musical education. ECMS offers a wide range of course options to match a student’s individual interests as they grow. Students in grades 7-12 may also consider enrollment in the Diploma Program, which includes requirements for continued private study, ensembles and a variety of classes. We are happy to help students prepare for college and a bright future!